In the 2013 phase of the Hebrew University of Jerusalem Ophel excavations, Dr. Eilat Mazar and her team set out to uncover more remains from the Solomonic period—and they did. 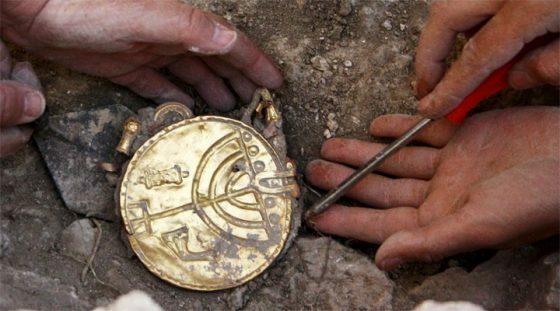 But no one expected the most stunning discovery of all to come in the first week of the dig, after excavators had barely broken through the surface of a new area. This fantastic collection was discovered about 50 yards south of the Temple Mount, inside a Byzantine structure that dates back to the sixth century c.e. It had most likely been carefully packed and hidden by a prominent group of Jews during the Persian conquest of Jerusalem at the beginning of the seventh century c.e. On April 22, 2013, Dr. Mazar and her staff went back into the field to continue the second phase of the renewed Ophel excavations. 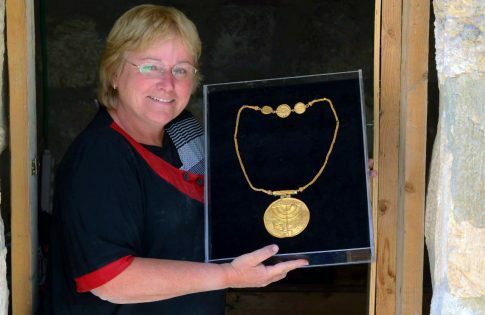 Just five days in, workers Caridad French and Ahinoam Meyers were excavating in a Byzantine-era structure when they uncovered a large gold earring. As they continued, the second earring appeared, and then a number of gold coins began emerging, strewn across the area. 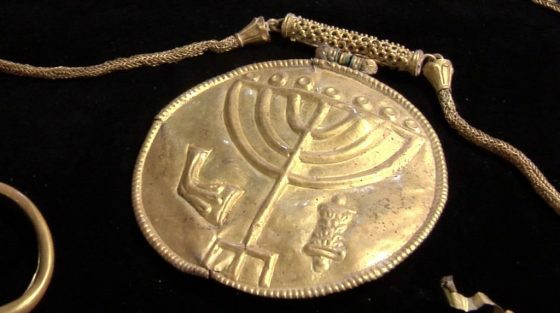 Dr. Mazar and her team believe the menorah medallion, which was attached to a gold chain, was probably used to adorn a Torah scroll—a practice that Jews have been known to do for millennia. If so, the medallion and accompanying items would be the earliest known Torah scroll ornaments ever discovered. This appears to be corroborated by the appearance of the Torah symbol on the medallion itself. A similar medallion displaying a Torah scroll alongside a menorah can be found on display in the Jewish Museum in London, though its origins are unknown. The Ophel medallion, like the London medallion, also depicts a shofar on one side of the main menorah image. The second bundle held 36 gold coins, two gold earrings, a broken gold-plated silver pendant and a pure silver ingot—probably all items that a Jewish resident of the city had intended to use as some sort of donation/payment. Numismatics expert Lior Sandberg, who examined the coins, concluded that the last possible date for their minting is c.e. 602. Therefore, the gold coins and their accompanying items must have been abandoned sometime after this date. Dr. Mazar postulates that the treasure was abandoned around the time of the Persian conquest of Jerusalem in c.e. 614. The cache was abandoned … most probably after the Persian conquest of Jerusalem and after the Persians changed their attitude to the Jews and allowed their expulsion from the city. The fact that the gold was not properly hidden nor taken back attests to the tragic circumstances that led to its abandonment.